Stellar is an open source digital currency that allow to cross border transaction. It has decentralize exchange StellarX and first lunch free decentralize free exchange. One of the great peer to peer digital currency marketplace. The team behind stellar support as a nonprofit foundation. Read the article and claim Free Stellar Tokens. Stellar come with a big news about free tokes airdrop! It’s going to provide $25 worth XML token for the blockchain.com user. If you never heard about Stellar than you might read this article to learning Stellar lumen. You can convart your digital currency to fiat currency through cross border transaction. It is take very less time to transaction for example 2-3 second. So ready to claim Free Stellar Tokens. If you are thinking why they are doing this airdrop? Honestly, it is a marketing strategy. This way they increase their Stellar community. Once upon a time PayPal had this type of campaign. PayPal spend million of dollar among new user to signup PayPal. Who signup they got $20 and in the same way who referral got the same amount. 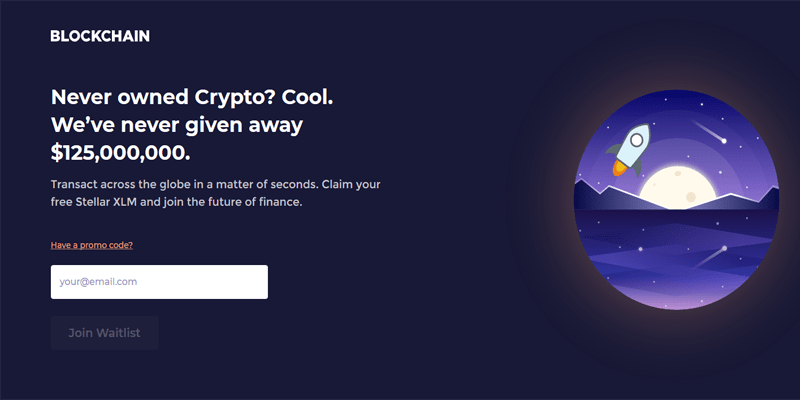 Just like other crypto platform Claim Free Stellar Tokens from blockchain.com. In the same way Stellar are giving up and committing they spend $125 million. Recently they have partnered with Blockchain.com and free giveaway airdrop on the Blockchain.com platform. Submit your email address and click on ‘‘Join Waitlist”. You will receive an email with instructions on how to claim your $25 worth of XLM tokens later. You might get 90-100 XLM tokens. Total amount of XLM token value $25. Already on the exchange this token are listed and approximately value $0.259. Still there have no referral program but I think very soon we will see the referral program on the project.